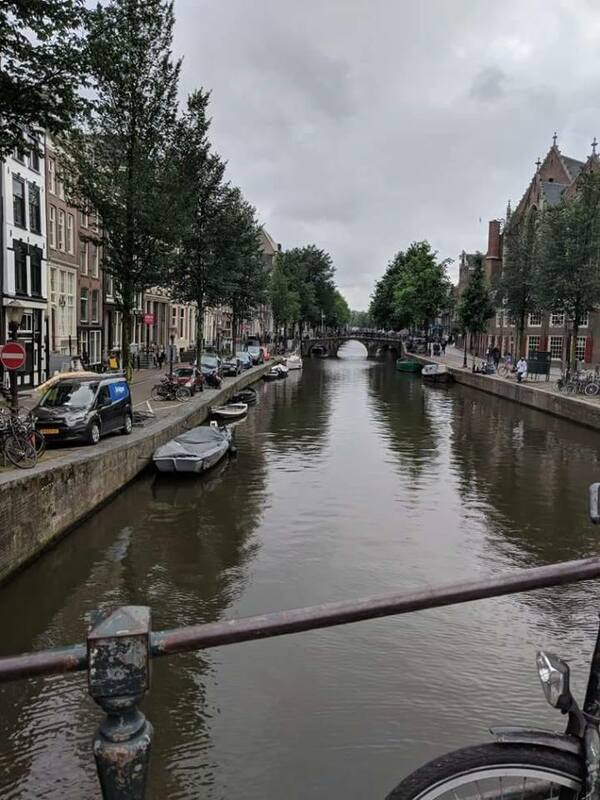 I haven't had a holiday in a while but I'm booked next month to go to Amsterdam with a couple of my favourite ladies and I absolutely can't wait! We've only got a few days in the city sadly but I want to fill it with as much as possible - and my early bit of research shows there is so much to do it's hard to know where to start planning! Here's a few of the things we hope to do on our trip! I wont lie, my interest in pancakes is one of the main reasons I'm excited to visit Amsterdam! I can't wait to try some of it's historic pancake houses and delve into a world of exciting and unusual toppings! I even heard about an all-you-can-eat pancake cruise, sounds perfect! I remember reading The Diary of Anne Frank when I was a teenager, and was fascinated by the life she and her family lived, hiding away in a Dutch attic. I'm sure and visit to the Anne Frank House will be emotional, but also incredibly interesting and educational. I'll admit that I dont have a lot of art knowledge, but that doesn't mean I can't appreciate a nice painting or two. One of the friends I'm travelling with really knows her stuff though: visiting the museums she wants to go to, like the Van Gogh Museum and the Rijksmuseum, will be like going on a guided tour with an expert! Despite not really having a head for heights, you can't beat the cityscape views you only get from as high up as possible! A'DAM LOOKOUT will have some of the best views over the city, and you can even 'swing over the edge' on a terrifying looking swing - but I'm not sure I dare go that far! 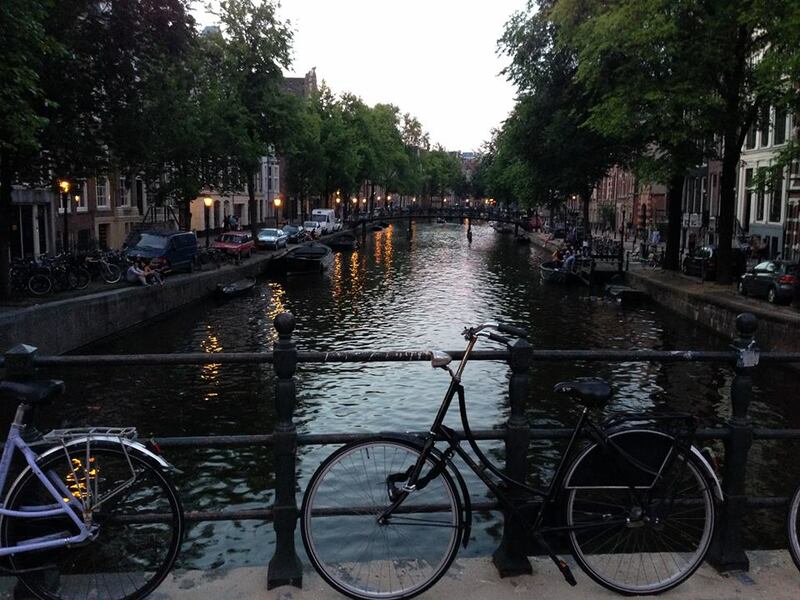 I know I've not even scratched the surface of great things to do in Amsterdam, but you've gotta start somewhere, right? And I still have plenty of planning time ahead! I'd really love to hear any suggestions you might have for things to do though, any hidden gems to share? Or places to avoid? I do love Afternoon Tea (cake, scones and tea, what's not to love?!) but don't get the opportunity to indulge very often at the minute much to my dismay! 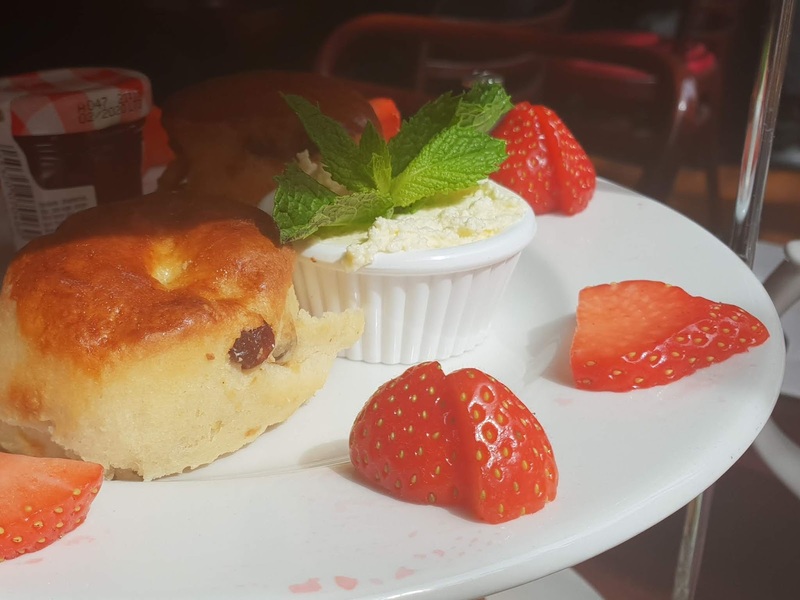 However I recently spotted a deal on Groupon for Afternoon Tea at Cafe Rouge for just £19 for two people and couldn't resist! Once I bought the Groupon it was easy to book a table online and we headed off to York, home of our nearest branch, to indulge! Even though it was a weekend afternoon in a busy city (and we were on a discounted deal) we were offered a great table right by the window - perfect for people watching over cake! It didn't take long at all for us to be presented with a huge pot of tea and three tiers of tasty treats! It's not often I say this but the savoury tier might have been my favourite! 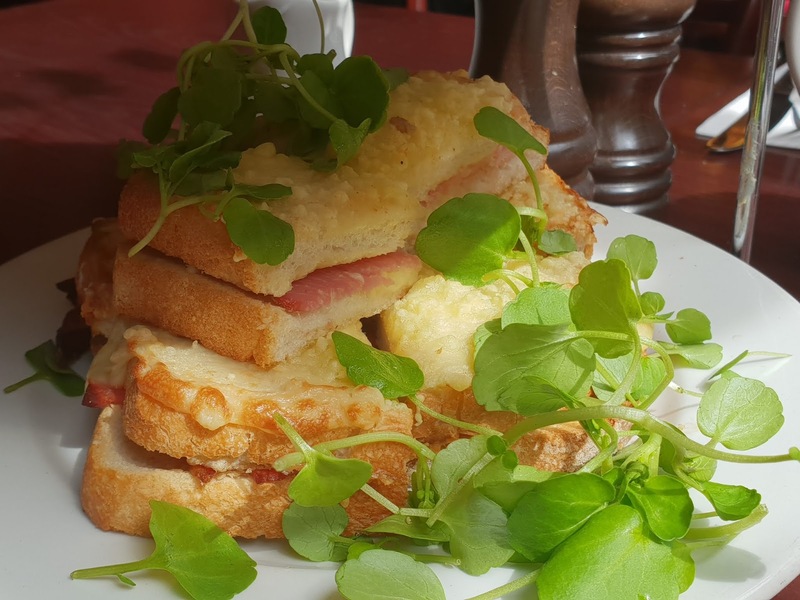 I know finger sandwiches are the usual thing for afternoon tea, but the French theming of the venue led to chunky slices of croque monsieur and these were absolutely delicious! I will freely admit to having more than my allotted share - apologies to Mr for stealing his! 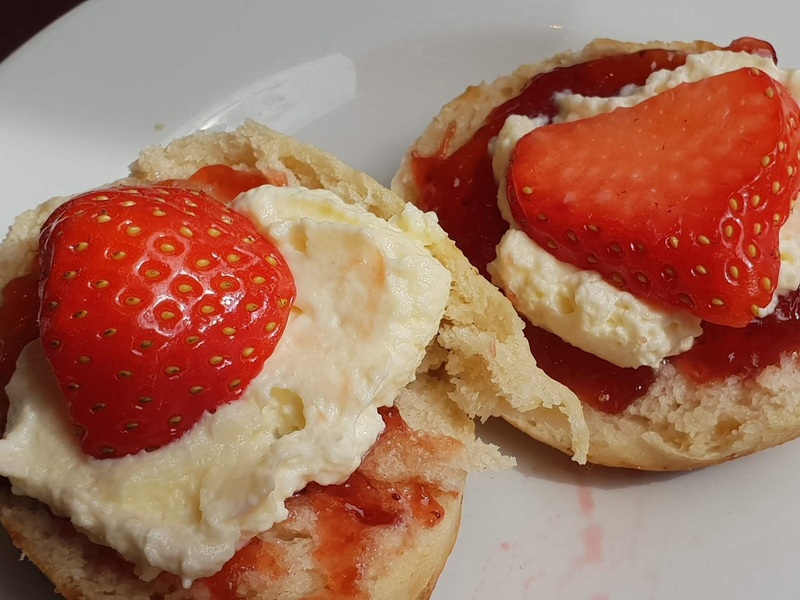 I always appreciate scones, and these were very tasty but not so big that they filled me up before I got to the cakes (rare, but it does happen!) - I also loved that they were served with fresh strawberries! 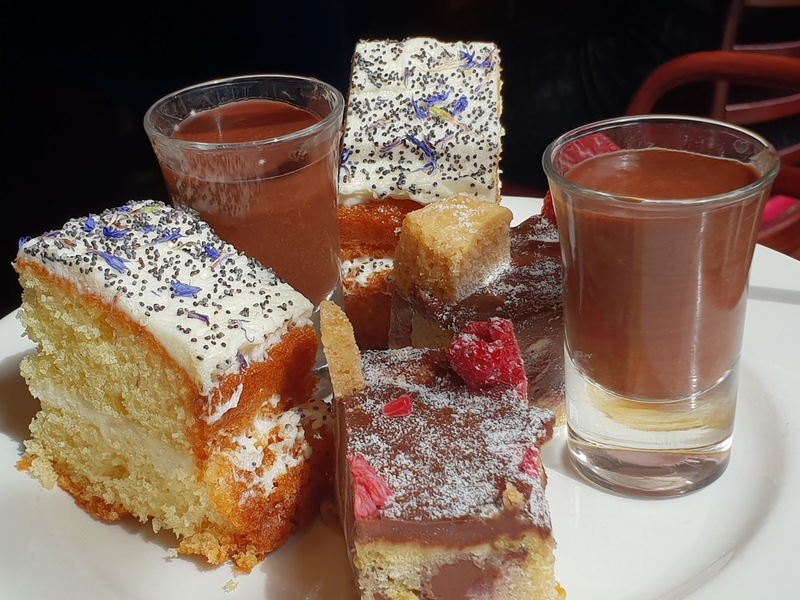 The cakes are invariably my favourites - this afternoon tea gave a lovely varied selection of a little chocolate mousse pot, chocolate and raspberry cake and a delicious light lemon sponge - the latter was absolutely my favourite but they were all pretty wonderful! It was my first time at Cafe Rogue and the York branch at least was delightful - the staff were helpful and polite and the old building is charming. I even spotted a sweet little garden out the back where people were enjoying drinks in the sunshine - I definitely want to go back and try some of their main menu offerings! I've made no secret of the fact that I adore Lush, but I'm not monogamous when it comes to bath supplies - I'm happy to jump ship to anyone who will sell me beautifully scented goodies to soak in, and The Yorkshire Soap Company are my second bath-love! If you've never had the pleasure of shopping in one of their Yorkshire based stores, then I suggest you aim to as soon as possible. It's quite a singular shopping experience - their gorgeous stores are light and airy and like high end patisseries, their stunning products displayed to their best on cake stands and pristine white shelves. The customer experience is less 'intense' than at their colourful competitors, but the staff are no less knowledgeable, passionate or well-trained. I didn't realise there was a Yorkshire Soap Company banch in Halifax until I accidentally stumbled across it recently (usually its their York store that I'm tempted by! ), but it would have been rude to not celebrate my discovery with the purchase of a sweetly-scented treat or two! 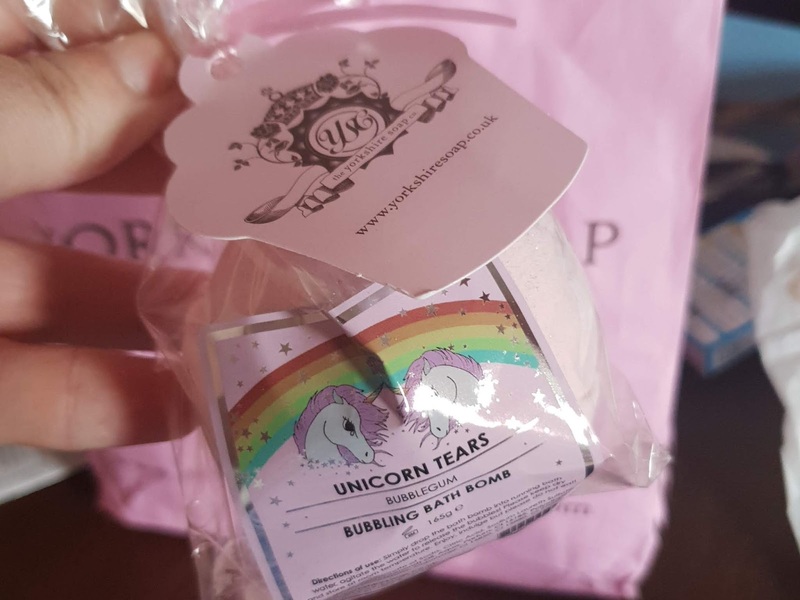 I couldn't resist picking up the sweet-as-pie bubblegum scented Unicorn Tears bubbling bath bomb! 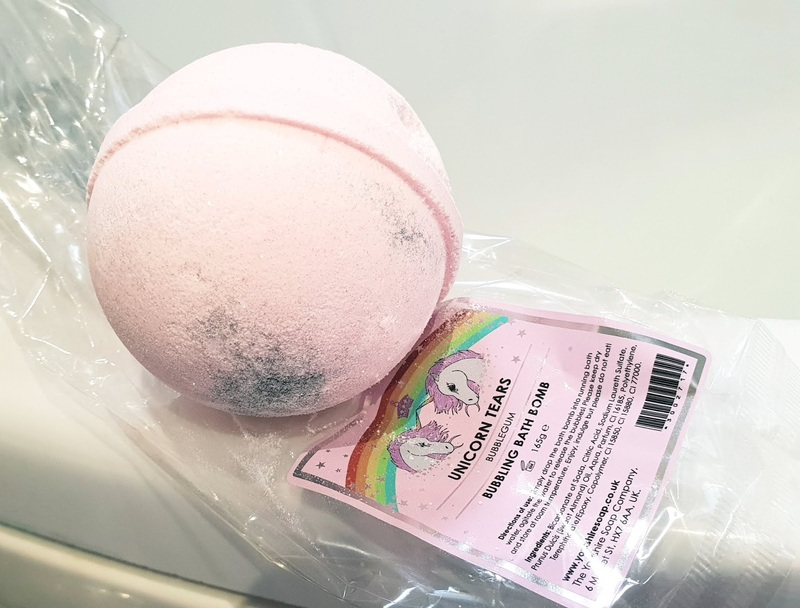 Like a lot of the signature fragrances at The Yorkshire Soap Co, the scent is featured across a number of different products, such as shower gel, body lotion and bath foam, but I always like the bath bombs as a sort of first point of call for trying out a new fragrance. 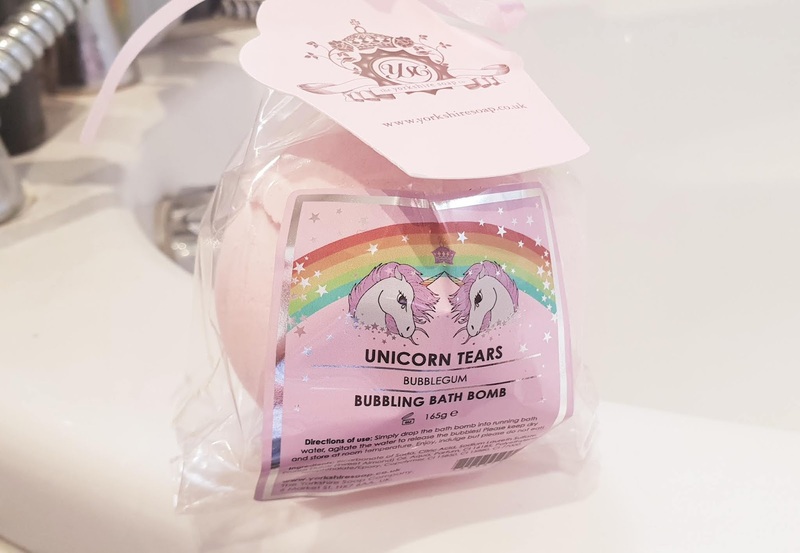 The Unicorn Tears range is a winner though - sugary sweet and delicious - and I'll definitely look to pick up more in the range when I get chance! 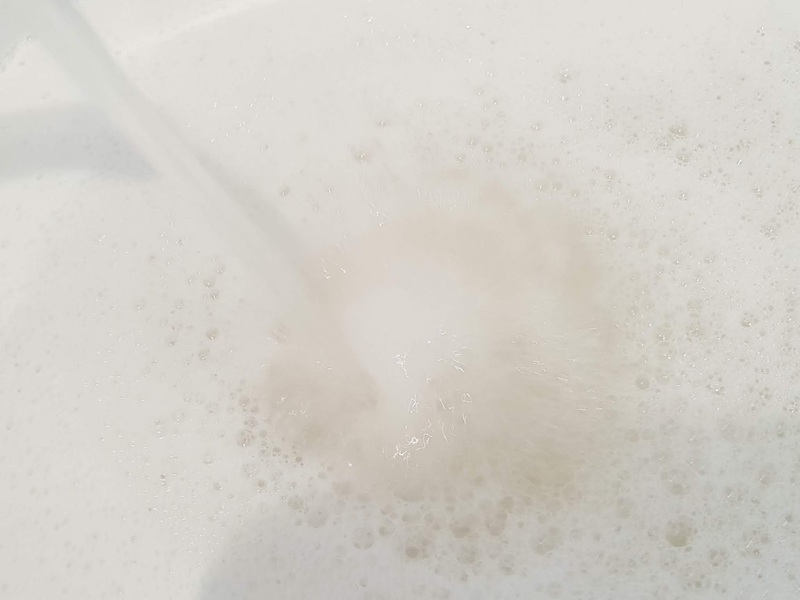 I was intrigued by the promise of a a 'bubbling' bath bomb but was still surprised to see that this did actually form bubbles when it hit the water! This also has a fine silvery glitter throughout which might give that bath water a vaguely unappealing grey look from a distance, but a lovely shimmery shine from the vantage point of being submerged in it! I'm hard pressed to pick a favourite range from the company - their 'Yorkshire Lass' blend is a classic, but this is a lovely addition for when I'm feeling playful and frivolous and I definitely recommend it! If geography prevents you from making it into store, you can also order online from The Yorkshire Soap Co! When I was little I loved having pen-pals, and I was always so excited when a lovely letter came in the post for me. It's now 2018 so pen pals are rare, and most of the things that come in the post for me these days are bills or spam, but one way I've found to recapture that joy of receiving something fun is via subscription boxes! 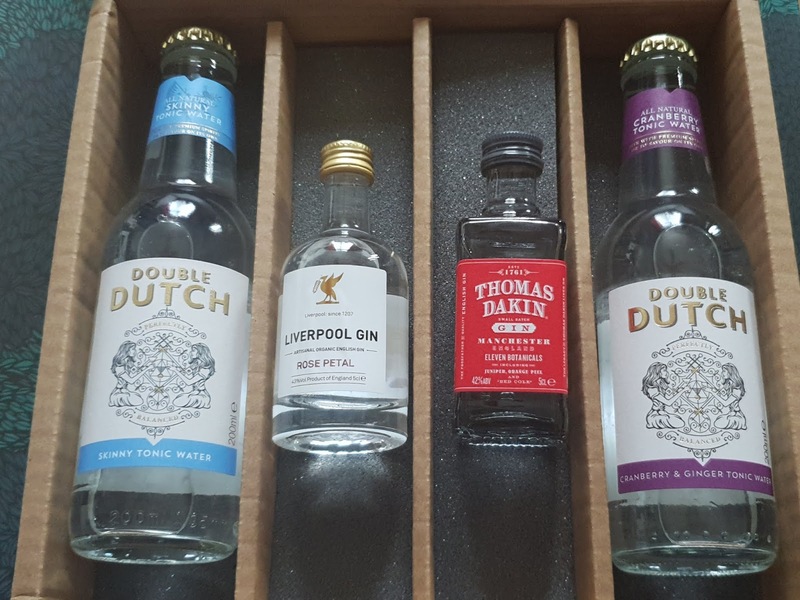 I recently signed up to the receive the monthly I Love Gin box and I thought I'd share with you what I got in one of mine so you know what to expect with an average box! The I Love Gin club boasts that it contains 4 G&T's, which tend to be made up of two gins and two tonics which can be mixed and matched to suit. 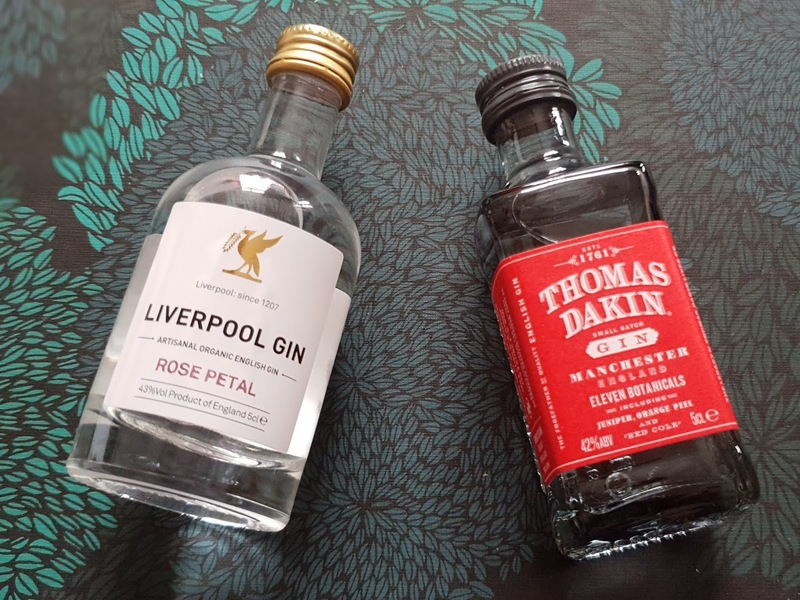 The gin selection will usually follow a loose theme - the one shown here was the 'Mancs and Merseyside' box which contained miniatures of Manchester's Thomas Dakin Gin and Liverpool Rose Petal Gin. 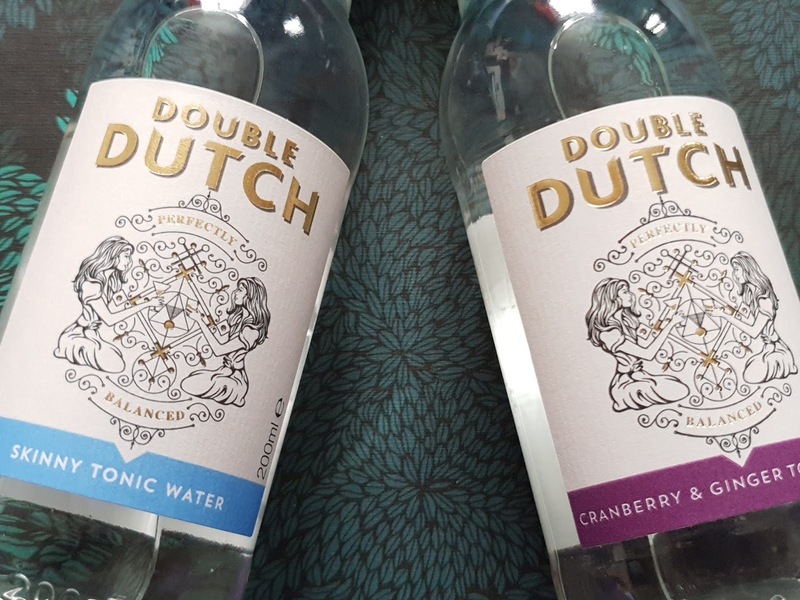 You'll also get a couple of full size tonics - this box came with a duo from Double Dutch, a skinny one and a cranberry and ginger. I was pleasantly surprised by the skinny tonic, as I've always avoided them expecting a corresponding dip in flavour quality. The cranberry and ginger one was delicious! In the box you also get a little booklet with information about all the brands, as well as space for your own tasting notes. 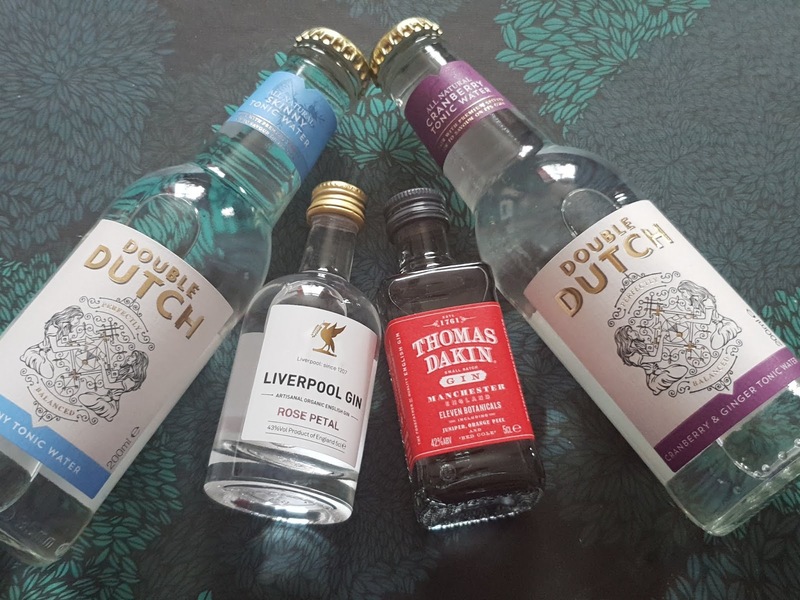 They also come with a £5 voucher to spend in their shop, so if you do discover a gin you love you can stock up on a full sized bottle at a discounted rate! I'd definitely consider the Liverpool Rose Petal gin as my next big investment bottle! 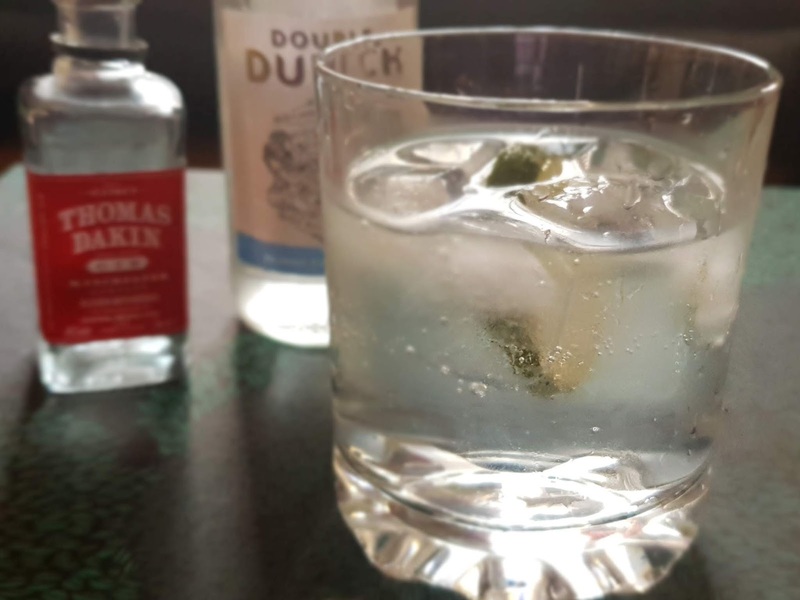 The I Love Gin subscription is £14 per month, which works out pretty good value if you think of the cost per G&T - especially if you use the voucher! I first signed up because there was a discount on the first box at the time, but I kept it up for a few months because I really enjoyed getting them! I'm currently taking a break but just because I have a backlog of stuff to get through but once I've made some headway I fully intend to sign up again - it's a great way to treat yourself and try new and upcoming brands! I know I've missed Easter already, so this review of one of Lush's limited edition Easter range is already a little past it's best but these are still available on the website (and presumably in store) for a little while so I thought it might be worth sharing anyway - I wouldnt want anyone to miss out on one of these Cream Egg Bubble Bars! My easter release purchases were limited, as I'm saving towards a holiday, but I couldn't resist this brightly coloured Bubbleroon when I caught the aroma in store. It's supposed to be mint-chocolate but I didn't get a lot of the chocolate scent - to me it smells just like those Spearmint Chew sweets I used to love when I was little and so I found the whole bathing experience as cheerful and comforting in the way that only reminders of happy childhood days can make you feel! 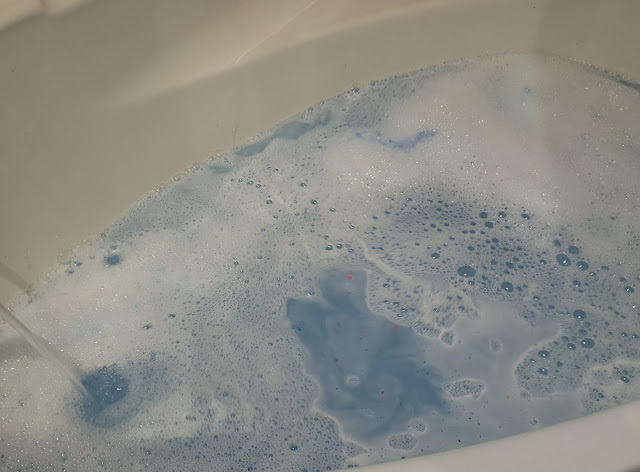 Aside from the nostagic scent, I loved the bright colours of the Bubbleroon and the soft blue that it made my bathwater. The bubbles were plentiful and fragrant, and the cocoa butter and shea butter that are included left me feeling super soft and pampered. 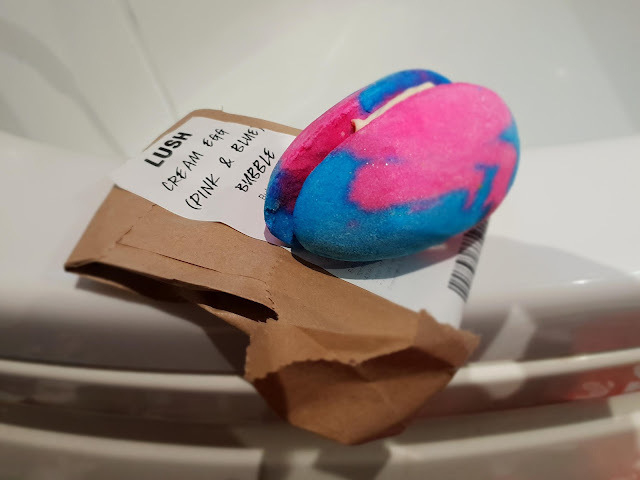 I always thing the bubble bars are one of the better value bath products from Lush as you can get multiple uses out of them, and this is no exception - I've already had two spearminty baths and have at least one more to go at! 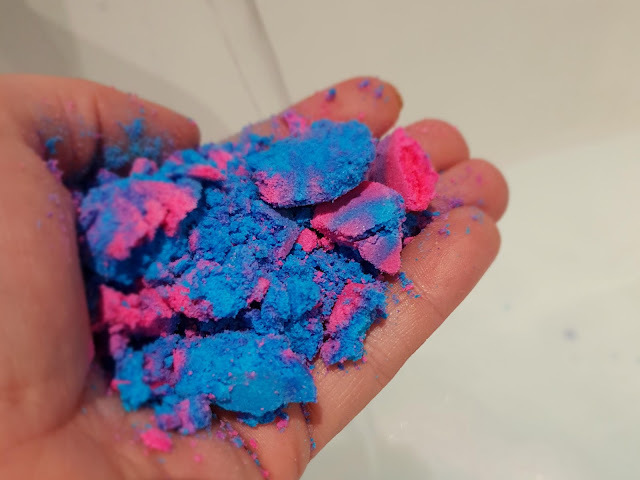 Overall this hasn't quite broken into my top Lush bath products (it's good but it's no 'The Comforter') but I really like it and would definitely buy it again! Here's hoping they bring it back for next Easter at least! Did you try Cream Egg? What's your favourite Lush product? The weather has been impossible to keep up with recently - piles and piles of snow one day to relative warmth the next. In fact, I've had both of those just today!I was't sure I'd even make it in to work this morning, and now the sun is shining! I've got a great way of staying warm and toasty and comforted, even when the weather catches you out! Not being a particularly big tea or coffee drinker, I take a great deal of solace in hot chocolate - especially when it's cold out. I've been a big fan of the Whittards Hot Chocolates since I was bought the Rocky Road one a few years ago as a Christmas present and I havn't looked back since! It was absolutely love at first sip! Obviously I brought a tub of it home with me and I can't tell you how much my life has improved from having it - especially over the last week or so of snow! 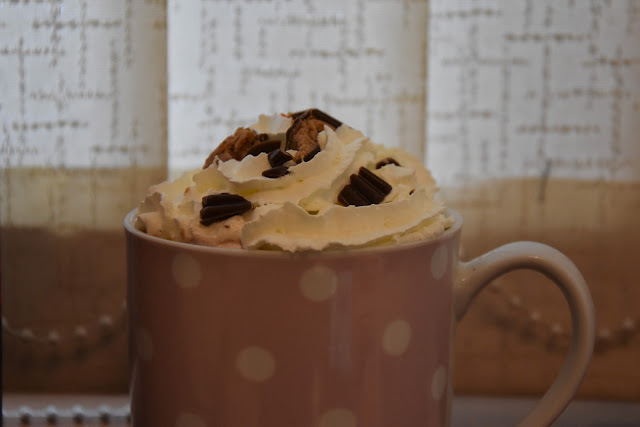 You need to make up the Hot Chocolate with hot milk, rather than just adding boiling water, so it needs a little more offort but this is fully repaid in taste - the result is a really creamy, indulgent treat, especially when topped with cream and sprinkles Reese's bits! Nest time you pass a Whittard store it's definitely worth popping in to see what they have available as testers, you never know when love might strike! 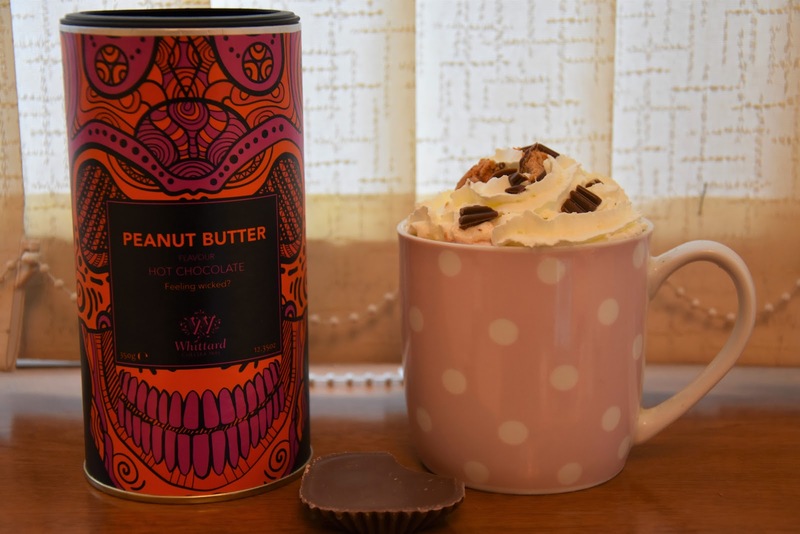 If you don't have a local store you can order online, where they have a great range of delicious sounding Hot Chocolate flavours - I think I fancy the Blueberry Cheesecake one next! Do you have a favourite winter warmer?